Experience High Adventure in the Heart of the Adirondacks! Plan your High Adventure Trek! We would love to see your unit join us “Up North” this summer for an unforgettable experience. Floodwood Mountain Scout Reservation has been the ultimate site for High Adventure for over 50 yrs. Floodwood is located near Saranac Lake, NY about an hour west of Lake Placid in the heart of the Adirondacks. With its many lakes, streams, and High Peaks, Floodwood is perfectly located to offer a High Adventure challenge second to none. 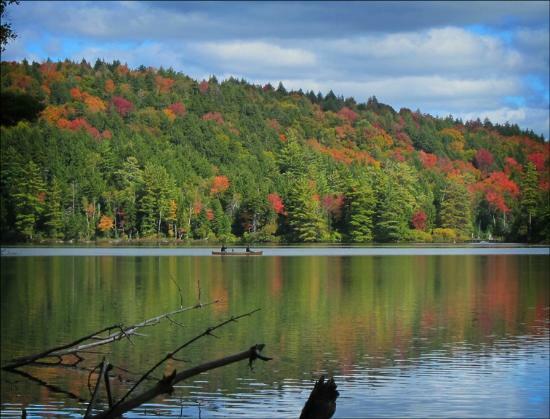 Choose either a canoe trek from our base located on Rollins Pond or backpacking trek into the High Peaks Wilderness. Accompanying your unit for your trek will be one of our experienced staff Voyagers, a trained wilderness guide. While 100% customizable canoe and backpacking treks are the mainstay of Floodwood, we also offer first class waterskiing/tubing, rock climbing/rappelling, archery, as well as many other day and overnight hikes and paddles. Floodwood is truly a special place in the Adirondacks and offers your unit the opportunity to create memories that will last forever! We would be happy to assist with any questions you might have for planing a trek. We look forward to hearing your from you.